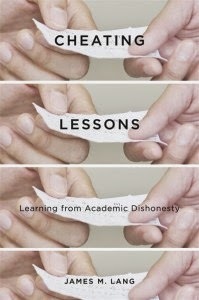 For teachers everywhere, Cheating Lessons: Learning from Academic Dishonsty (Harvard University Press, 2013) explores the root causes of cheating in education, and considers how we can best inspire our students to learn. You can find a nice overview of my argument in an essay that appeared in the Boston Globe, as well as in this interview from insidehighered.com. I have been fortunate enough to present the research from Cheating Lessons at dozens of colleges and universities (and even some high schools) in the U.S. and abroad. If you are interested in learning more about how Cheating Lessons might help inspire new approaches to academic dishonesty at your high school, college, university, or business, please visit the "Speaking" page for more information.